Storyline: Angus Buchan, a Zambian farmer of Scottish heritage, leaves his farm in the midst of political unrest and racially charged land reclaims and travels south with his family to start a better life in KwaZulu Natal, South Africa. With nothing more than a caravan on a patch of land, and help from his foreman, the Buchan family struggles to settle in a new country. Faced with ever mounting challenges, hardships and personal turmoil, Angus quickly spirals down into a life consumed by anger, fear and destruction. Then starts the life journey of this man who, like his potatoes, grows his faith, unseen until the harvest. 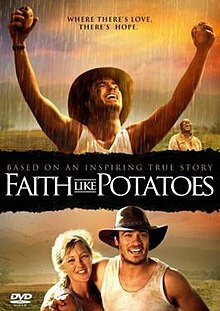 This is a Watch Online Link of Faith Like Potatoes. Thanks again Samuel, for your wonderful help..! PRAISE CHRIST JESUS! FAITH LIKE POTATOES. NOW, THAT IS SOMETHING TO THINK ABOUT. FAITH, FAITH, YOU DON’T NEED A WHOLE LOT. USE WHAT YOU GOT. FAITH. FAITH, JUST A LITTLE BIT OF FAITH. TO EVERY MAN, JEHOVAH HATH GIVEN A MEASURE OF FAITH. JESUS LOVES YOU SO VERY MUCH, AND SO DO I, UNCONDITIONALLY! I can’t download a thing!!!! I realy do not know how to download this movie. watching online is realy difficult here because of week internet connection. what must i do?